100 Days to WBSC U-15 Baseball World Cup in Panama! 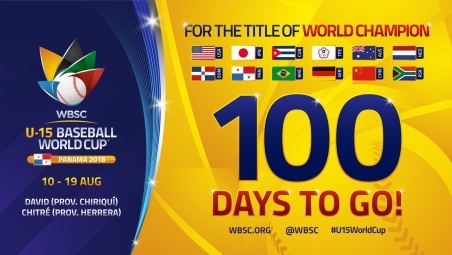 Today, 1 May, marks 100 days before the start of the IV WBSC U-15 Baseball World Cup® -- the highest-level competition in baseball for 13-15 year olds -- which opens on Friday, 10 August in Panama. Group A -- host/No. 14 Panama, World No. 1 USA, No. 6 Chinese Taipei, No. 19 Brazil, No. 21 Germany and No. 22 China -- will begin the global baseball celebration For the Title of World Champion at the new US$ 16 million, 8,500-seat Estadio Kenny Serracín in David (Province of Chiriquí). Group B -- No. 2 Japan, No. 4 Cuba, No. 8 Australia, No. 9 Netherlands, No. 12 Dominican Republic and No. 26 South Africa -- will be based at the 3,000-seat Estadio Rico Cedeño in Chitré (Province of Herrera). The top three finishers from each group will continue the round-robin in the Super Round. The top two nations in the standings will compete in the Final, with the winning nation to earn 460 points in the WBSC Baseball World Rankings. Cuban National Teams have won the last two U-15 Baseball World Cups, while Venezuela won the inaugural edition in 2012. Including the 14 editions of the U-16 Baseball World Cup (1989-2011), Cuba has featured the best youth team on the planet six times, while the U.S. has won the world title five times. The WBSC U-15 Baseball World Cup is staged every two years and features the best youth players in the world competing on their National Teams for baseball's Official World Championship in the respective category.